Finding a permanent solution to hair loss is a big step and at RHRLI we know that taking that step doesn’t always come easy. 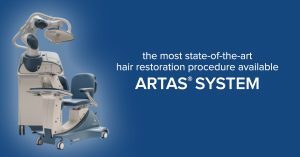 Even though RHRLI is the only hair loss treatment center on Long Island that employs the ARTAS® system, the most state-of-the-art hair restoration procedure available, it’s understandable that our patients will have questions, concerns, and even anxiety before they make their decision to seek treatment. So we want to ease some of that anxiety by letting you know about the benefits of ARTAS® which employ robotic technology to give you the most accurate hair transplant procedure out there today and a full and healthy head of hair. We also want to share with you some of the concerns we often hear about prior to a hair transplant procedure and why we feel the ARTAS® system is the best option out there for those people seeking a solution to thinning hair. It’s important to understand that if you feel high levels of anxiety or depression related to your hair loss or your hair restoration procedure and feel overwhelmed, you should consult a mental health professional immediately. But it’s not uncommon at all to feel nervous. So the first question we want to address is how the procedure works. According to the ARTAS® website, the procedure is a minimally invasive procedure that uses precision robotics to look for healthy donor hair that is used for transplant. The donor hairs are usually found on the back of your head. Unlike other procedures like strip surgery, there’s no need for stitches or staples and there won’t be any linear scar once the procedure is done. One question that we commonly get is whether or not the procedure hurts. Because ARTAS® is minimally invasive, you’ll only feel mild discomfort after the procedure has ended. You won’t feel pain at all during the procedure because a local anesthetic will be used. According to patient information given out prior to the procedure, you usually can go back to your normal daily routine the morning after the transplant. Some patients experience swelling which will usually go away in 1 to 3 days. Another concern that makes patients anxious prior to their hair restoration procedure is how they’ll look immediately following. Since there is no linear scarring, people won’t notice that you had a transplant and new hair will start to grow in 3-5 months. The new hair grows in gradually, so it’s likely people won’t notice you’ve had the procedure. About 6 months after the hair transplant, you’ll begin to notice improvement and you’ll see full results in about a year. Once you have a fuller head of hair there’s a very good chance that you’ll have less anxiety. You’ll feel more confident in social situations and you’ll have a better self-image. RHRLI can help you feel better about yourself. To get learn more, Contact RHRLI today. Previous Post: « Is There a Link Between Dandruff and Hair Loss?